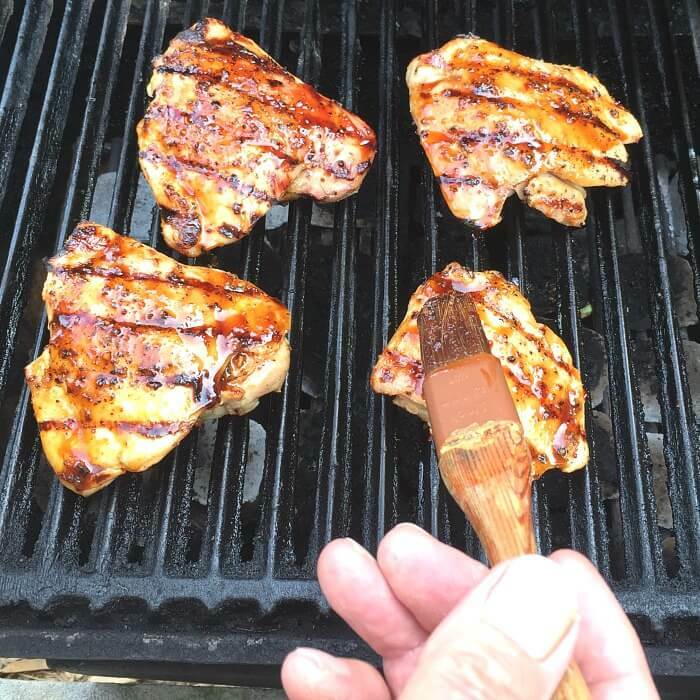 “How’s grilled chicken thighs sound for dinner?” Honey asks as he’s trimming the fat off of the thighs. “Sounds good,” I reply, still tapping away at the computer keys editing the page I’m on. “Oh, yum! That spicy sauce is fantastic. It has just the right amount of heat to blaze my taste buds. And the taste, oh my gosh, my mouth is watering just thinking about it. Wait! If we’re going to make the chicken thighs with that sauce I’ve got just the name for it . . .
“It is. We better hurry to the store so we can get back and start. The chicken needs to go in a brine.” At the car, Honey suddenly stops and says, ” I got a better name for the dish . . . are you ready? ” Patience is a virtue, my love.” Honey is mixing up the basting and dipping sauce in a small bowl. He puts half of the sauce in another small bowl. “Why did you do that?” I ask because I’m thinking of the extra bowl to wash.
” We use part of the sauce for basting,” he said. Our grill is ready for the chicken thighs at medium high. Honey drains the brine from the thighs, seasons them with salt and pepper, then places them on the grill. He grills the thighs until golden, about 15-20 minutes. He only flips them over once or twice. Flip them too many times and you end up with jerky. When the chicken thighs are close to done, around 155 F., he bastes them with the sauce, turns them, and bastes the other side. He continues to baste them and lets them cook a little while longer, about 2 or 3 minutes. The internal temperature is 165 F when he takes them off. 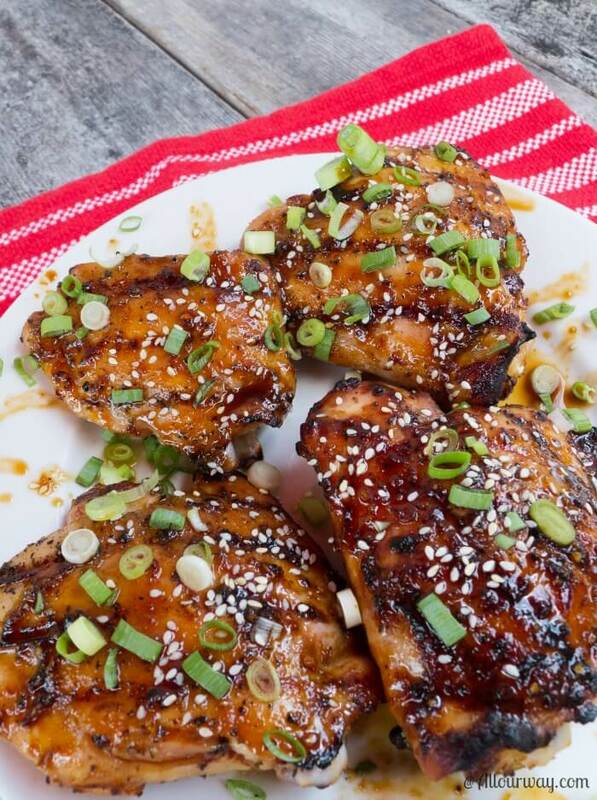 Right before we’re ready to eat, he garnishes the grilled chicken thighs with sesame seeds and minced green onions. 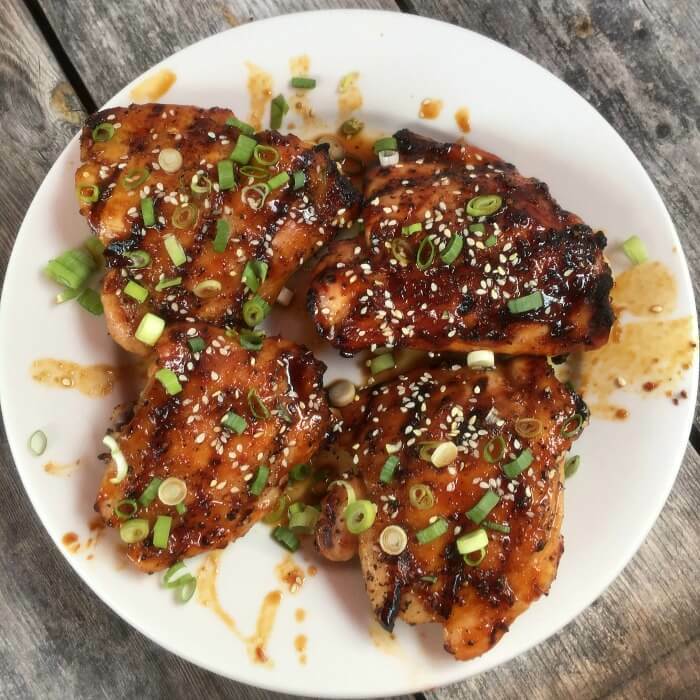 Of course along with our delicious grilled chicken thighs we serve the amazing blazing Asian sauce. 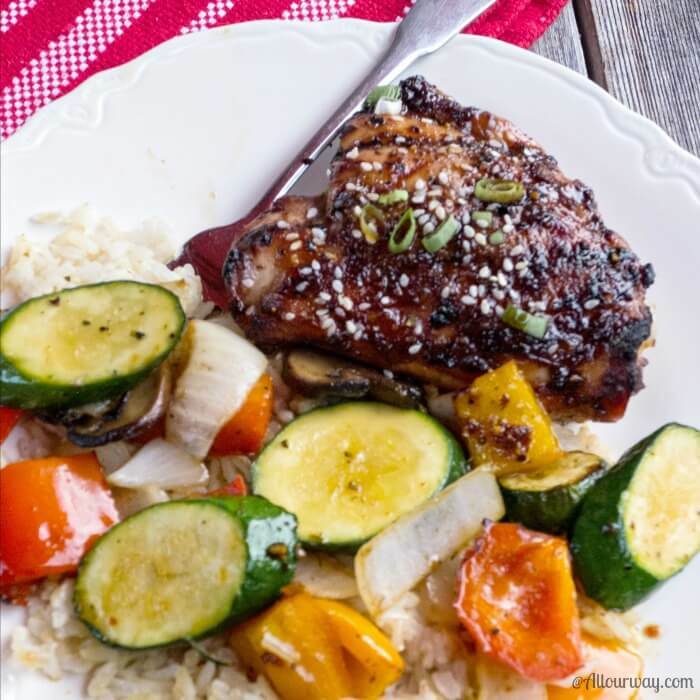 We served our grilled chicken thighs with Grilled Peppers and Onions and added zucchini. And yes, the sauce was mouth-watering and the thighs were finger licking good! Try them out and see for yourself. Tutti a tavola e pronto! A finger-licking good blazing spicy Asian sauce coats golden grilled chicken thighs and more of the amazing sauce is served for dipping. Wings can also be used. Trim the excess fat from the chicken thighs. You may leave skin on but we removed it. In a large glass bowl, combine water, salt, 1/4 cup of the chili garlic sauce and 1/4 cup of the honey. Stir until the salt is dissolved. Add the wings and chill for 30 minutes or up to 4 hours. 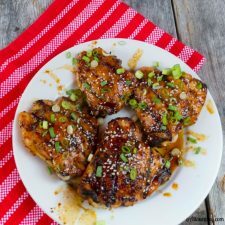 To make the basting and dipping sauce, in a small bowl, combine the remaining chili garlic sauce, soy sauce, sweet soy sauce, sriracha, remaining honey, vinegar, and ginger and mix well. Set aside half of the sauce for serving in order to avoid contamination. Heat the grill to medium high. Drain the thighs or wings and season them with sea salt and pepper. 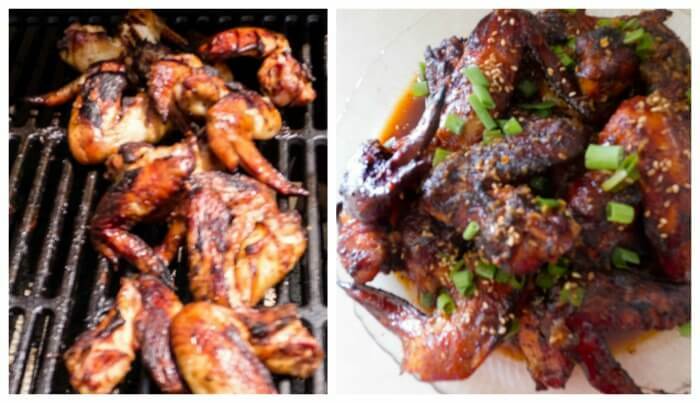 Grill the thighs or wings until golden, 15-25 minutes, turning as needed. DON'T turn too much. When the thighs or wings reach a golden color, around 155 F, baste them with sauce, turning as needed until the wings are glossy, well coated and reach 165 F.
Remove to a serving platter and garnish the wings with the sesame seeds and green onions. Serve with the reserved dipping sauce. If you want to lick your fingers you have our permission - it is acceptable and highly recommended. They are tasty, Dee!! The Asian flavor is really good. Do you use boneless or bone-in thighs? Thanks. Looks like bone-in, skin on. Hi, Marlene! We had bone-in skinless thighs. We don’t usually eat the skin and we didn’t want to waste that delicious sauce on them. Hope you try them — a favorite with everyone. Hi, Susie!! Well, another day of fishing without catching. Oh, well, it was a beautiful day. Chicken thighs are the best to throw on a grill! So much flavor, and they stay so juicy as well! That sauce is to die for. This great recipe of a grilled chicken. look like this sauce is highly versatile, I think we can use it in seafood. too. Love to try it with salmon. You’re right Swathi! The sauce is so good it would go well with any kind of protein. I’m even thinking if someone is a vegan it would be great on firm sauteed tofu! The flavors are fantastic!! I hope you do try the sweet soy sauce. The entire flavors really work well together. I never tried this flavor combo on chicken before. We do love to eat chicken so I’ll be making this very soon. Looks fantastic. Mouthwatering. 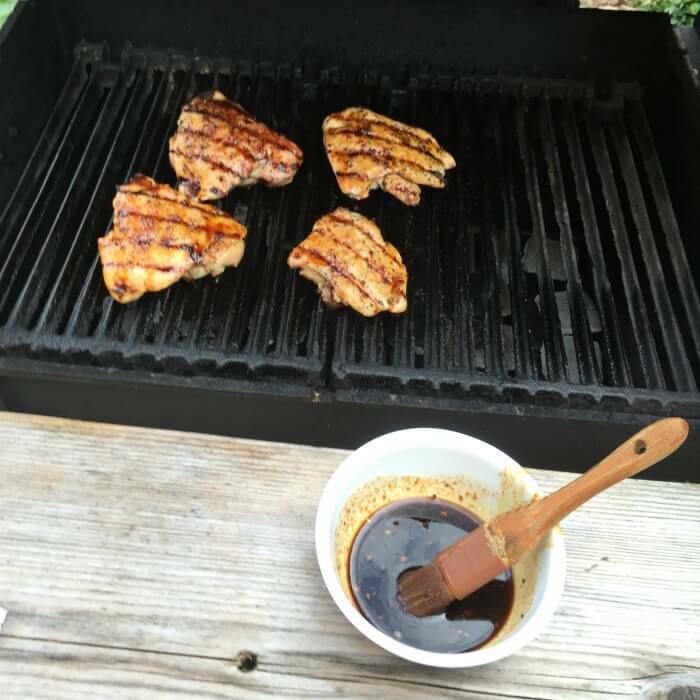 Grilled chicken thighs are the best and this glaze sounds incredible! Nom-nom-nom!! Definitely trying this! Please pass on the bowl of rice, I want that for dinner! Being Asian myself, this is certainly the kind of food I enjoy – lots of complex flavors that make my tastebuds sing! Chicken thighs are my favorite cut of chicken to cook with and to grill. This looks so perfect for a yummy weeknight dinner! That sauce with the Asian flavors is marvelous and I am in love with it. I am sure the chicken would have tasted wonderful with that sauce. Did you make the sweet soy sauce yourself? I have never seen them in the stores here. I need to keep an eye for it next time I am at the local Asian market. This looks sooooo amazing and that blazing Asian sauce is spot on. Love all that sriracha, garlicky and honey flavor you have going on in the sauce. 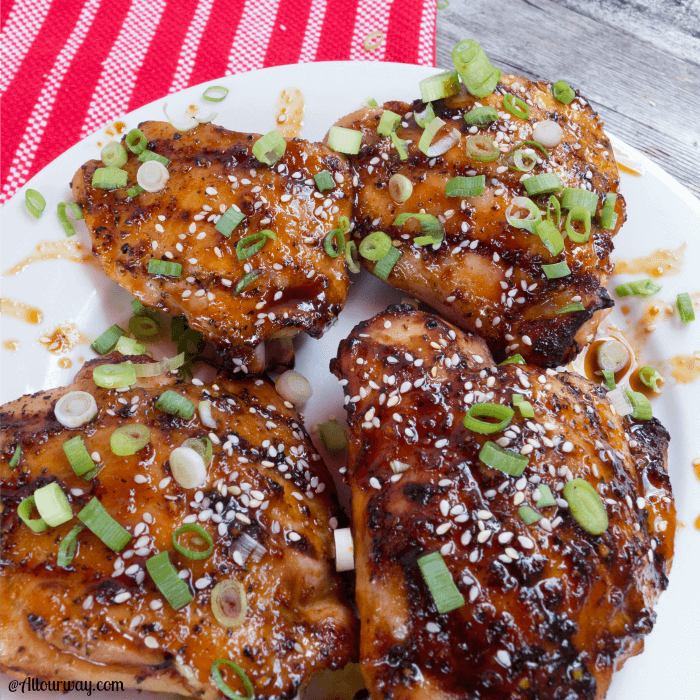 The grilled chicken thighs look absolutely juicy! Marisa this looks so yum!! 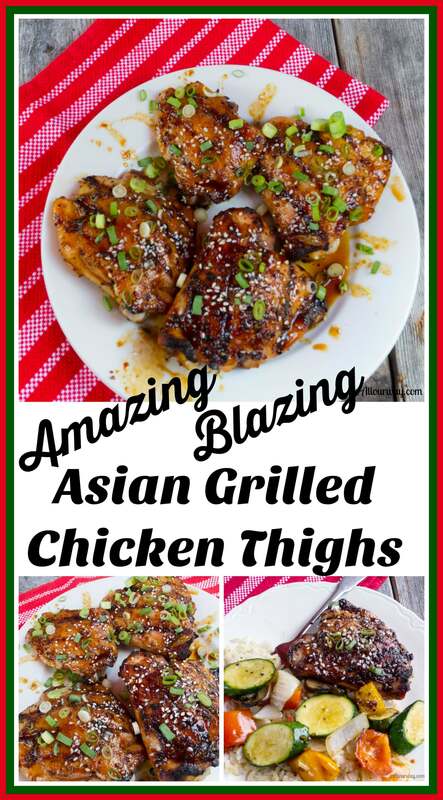 I love cooking with chicken thighs especially on a BBQ. Never hear of sweet soy sauce. need to go look for it. These sound so yummy! I love asian flavors. I bet the sauce is so sticky, sweet, and salty – yum! Hubby and I love cooking together too. Chicken thighs are so delicious…and we both love them. The flavour profile sounds amazing…and hey…anything with Sriracha is good to go as far as I’m concerned. Happy grilling!! It sounds like you guys have such fun cooking Marisa. But that’s the way it should be fun and tasty and I can only imagine how mouth watering these must have been. Love the Asian sauce you used as a glaze. I know I like the flavor you created on this chicken. I really like the appearance – the glaze looks great. Marisa, Honey has definitely come up with a great recipe and the perfect name for it! What a guy! Hi, Jean!! Thank you — Love to cook with my Honey. Hope you’re someplace where you’re not getting the storms. Have a Happy Labor Day!! These look wonderful! And I happen to have some chicken thighs in the freezer. Thanks for the recipe! Thank you, Randi! It’s my pleasure. Hi, Susie! The sauce is fantastic. Your crew will love it. Have to apologize for the comment section – something is wonky with the way it’s showing. Hopefully will get it fixed tomorrow. Love to all!! These sound so delicious, I wish I could barbecue tonight! So yummy! Ciao, Christina! It is yummy. We are having it again this weekend. I think I could easily eat the sauce with a spoon. I’m a huge fan of chicken thighs. They are always more tender and flavorful than chicken breasts. Love the Asian spin! Thank you, Karen. We wouldn’t have found this recipe if it hadn’t been for our son. It’s a keeper, for sure! These chicken thighs look fantastic. Oh and I love that dipping sauce! Awesome recipe. Love Asian flavours especially when it comes to chicken! The soya sauce always adds a special taste to the food, would love to try your version. Hi, Diana! We like the Asian flavors also and this sauce we found especially good. I’m sure you’ll like it. You have a great family, Marisa. This does look like an amazing recipe. I love Chinese food and make it at home often, but I have never heard of sweet soy sauce. Will need to check this out so I can make these great looking thighs. Thanks for sharing. sounds so delicious Marisa ! Have a nice weekend, un abbraccio ! Grazie Chiara! Buona giornata e weekend, un abbraccio!